Whether you are looking to conquer the hardest roads, trails, mountains, or your local spin class, Tommaso shoes give riders what they need to reach that next level of training and performance. For most cycling enthusiasts your first pair of clipless shoes and pedals makes cycling a completely new beast. For the employees of Tommaso bikes a clipless set-up is always the first recommendation for cyclists looking to making the next step. The Pista shoe offers women's specific perfection for road biking, spin class, commuting, or fitness riding. They are specifically designed to offer riders maximum comfort and power transfer, assuring more riding efficiency. The Pista 100 is our entry level dual compatible (SPD & SPD-SL) shoe, designed to be the perfect segway to clipless riding, for riders who want the most out of every pedals stroke. It offers 3-strap comfort and adjustability, with a stiff fiberglass reinforced polyamide sole for incredible power transfer. BUILT FOR SPIN CLASS: Everything about the Tommaso Pista was specifically designed to offer spin class riders the best performance and value possible, at a great price. Dual cleat compatibility means that no matter what pedal system your spin class uses, the Pista will work perfectly. We provide everything you need, PISTA SHOES, CLEATS, & INSTALLATION WRENCH. No one offers a better spin bundle anywhere! QUALITY & PRECISION FIT: 100% Fit Guarantee, 100% Free Fit Returns, 2 Year Manufacturer's Warranty. Please use Size Chart to ensure correct fit. Low profile hook and lock Velcro straps offer precision ergonomic fit, adding comfort and security to all of your rides. GET A BETTER WORKOUT: Exercise the full range of muscles, by being able to push and pull on every revolution. Get the most out of every pedals stroke with our fiberglass reinforced sole, which provides optimal stiffness and maximizes power transfer. This breakthrough technology allows users to ride longer and faster using less energy. 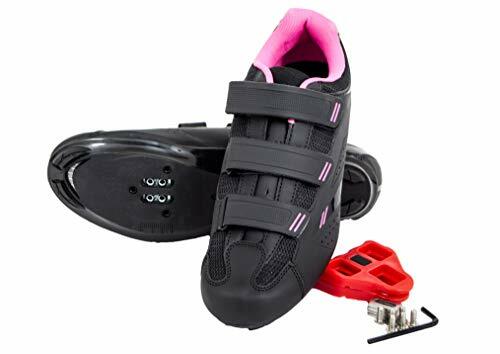 MAXIMUM COMPATIBILITY: the cleat area is compatible with SPD-SL, SPD, Look, and Speedplay cleats, offering the perfect platform no matter what pedals you ride. This combination makes the Pista perfect for spin class, as well as road biking and touring, giving you the most versatility for your lifestyle.